Blenko Blown glass art made in the USA. 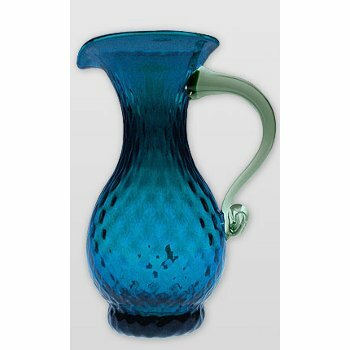 This ocean blue classic pitcher is designed with old world style. It is exquisite in color made by skilled craftsmen. These creative designs have made Blenko famous in the ancient craft of hand-blown glass. Over the years, talented designers have developed contemporary new designs for our skilled artisans, who have learned the difficult techniques of glass blowing through many years of practice. You can use this pitcher as a water pitcher or sangria pitcher. It is so beautiful you could also set it on a shelf to be admired. Located in Milton, WV Blenko Glass is an American institution and has been in business since 1893. Exquisite color, skilled craftsmen, and imaginative designs have made Blenko famous in the time honored craft of hand blown glass. In a world of every increasing automation, the Blenko company prides them selves in paying particular attention to the forms and designs of their handcrafted products. Blenko products can truly be appreciated for there uniqueness. For over 100 years Blenko has maintained and will carry on the tradition of handmade glass. Offering functional and art glass pieces that are mouth blown sheet glass.